ALGC has a very active IDPA program, holding competitive events at least once a month, through the season. 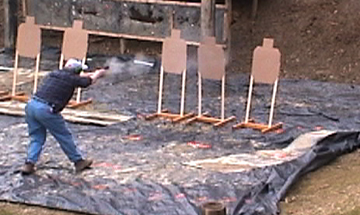 The IDPA program at Ashland Lake is a very shooter friendly program. After every match, we provide some kind of lunch built into our match fee. We like to sit around and chat about anything and everything. Please take some time, come on up to the pavilion after our matches, and relax a while. Welcome to another year of shooting IDPA at Ashland Lake Gun Club. Once again this year, we will get off to an early start with a match on Sunday, March 29. If it is snowing, blowing and cold, we’ll call it “March Madness”. If it is nice out, we’ll call it a great idea. We have a total of 5 regular matches scheduled this year along with an Introduction to IDPA Clinic, a Classification Match and a Back-Up Gun (BUG) Match. If you notice on the schedule, September is to be determined. Keep an eye on the ALGC web site for something big!!! Please make sure to look at the starting times for the matches as they vary. See you on the range. IDPA Clinic - An introduction to the shooting sport of IDPA.- Pre-registration required and available soon here. For a map of the club showing the Pavilion and pistol ranges, go here.